The week of July30 started with a mixture of excitement and apprehension as twenty children of Scandinavian decent converged on VASA Park in Agoura Hills, California. Under the direction of Ann Heinstedt and with the assistance of Kristin Spaberg and Bobbi Howard, the VASA Park Association Viking Village was successfully underway. 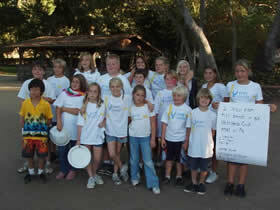 During the week long camp, VASA children were given the opportunity to learn about their Scandinavian heritage. A family potluck dinner on Sunday evening kicked off the week. Children came from as far away as San Clemente, Lake Arrowhead and Valencia to join in the festivities. During the week, the children participated in Camp Keystone’s activities which included go-carts, waterslide/swimming, rock climbing and horseback riding. In the evenings, they learned basic Swedish words and numbers, learned Swedish folk dancing by the VASA Jr. Folkdance Club, made Swedish crafts under the direction of Carolyn Salk, sang songs around the bonfire (Walpurgis Night) and formed new friendships. Also discussed was the children’s origin of ancestry, names days and geography. All the children participated in a high energy game of soccer which resulted in a tie. Breakfasts and dinners were prepared by Bob Salk and Gary Spaberg with many compliments from children and chaperones alike. The children had the opportunity to enjoy night time swimming and horseback riding with desserts of Swedish pancakes and heart shaped waffles as an unexpected treat. The week concluded with a Swedish meatball dinner for the children and their families on Friday evening. There were lots of hugs and goodbyes, phone numbers and email addresses exchanged and all the children look forward to the opportunity to participate again next year.